Savour an exquisite Mas Amiel wine dinner pairing experience with fine dining Petrus’ French cuisine. Our guest of honour winemaker Mr Nicolas Raffy will take you through the beautiful appelations of Roussillon, with a vertical tasting of world-famous fortified wine AOC ‘Maury’. 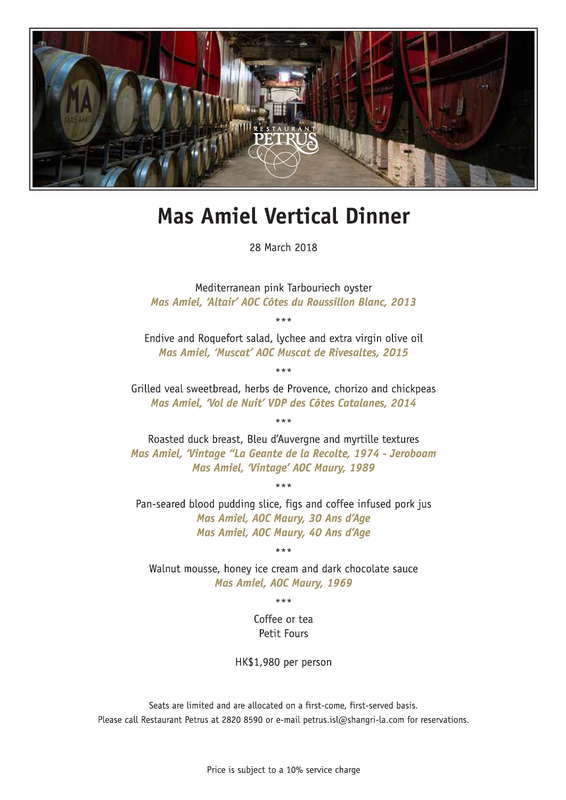 Back vintages of Maury 1989 and 1969 will be sent especially for this dinner, including a Jeroboam of the great 1974 vintage from Mas Amiel’s confidential Wine Library. RSVP Please note that places are limited and will be allocated on a first come first served basis.